Shortly after the dismantling of the original horse tram network, the Mukden (present day Shenyang) municipal government began work on an electric tram line in July 1925. To make way for the new and expanded tramline, nearly 1200 homes had to be demolished. Interestingly, Shenyang’s TaiQingGong Buddhist temple [太清宫 – the temple to the east of Shifu Square, about midway between Shifu and Zhongjie] was nearly a victim of the expansion. Fortunately, the temple’s abbot was able to convince local authorities to lay their tracks around the location. It's interesting how empty the Shenyang skyline is, and how few smokestacks are visible compared to pictures from later decades. The first phase of the project was completed in October 1925. Eight high-capacity trams and two DC generators were imported from the German company AEG and a large renovation project saw new lines installed straight from TaiYuanJie’s Mukden Zhan to the historic West Gate. The new trams were heavily protected; parents were warned there would be consequences if children were caught playing on the rails or leaving objects for the trams to run over. On November 11 of 1925, over a year since the new tramline began under municipal control, the Japanese Consulate General of Mukden pressured local leaders to put the tramline’s control under the Japanese Okura zaibatsu*. By the 30th, a contract had been reached that granted Okura virtually complete control over half the city’s tram operations. This scene is looking east from the Shenyang Zhan railway station. 1931 was looking like a good year for the tram service. The tram service had over 200 employees and wages were, for the time, very reasonable. A director could earn 160rmb per month and a driver could earn 80rmb per month (by comparison, the average income for a bus driver in 2004 was just over 1,000rmb. A pilot in 2004 could be expected to earn just under 7,000rmb). Drivers could also expect to receive a bonus of 2% of the ticket revenue for their route. Rates for the trams cost 1 mao 5 fen (1毛5分 - essentially 15 Chinese cents) for good seats, 1 mao (10 Chinese cents) for regular seats, and 7 fen (7 Chinese cents) for students. Fourteen trams were now servicing the city, carrying over 16,500 passengers daily. The already 7km network had secured additional funds for expansion. Unfortunately, everything fell apart with the September 18th Incident (aka “The Mukden Incident”). September 18th 1931 was an earth shattering moment in Shenyang when two Japanese military leaders in Mukden setup explosives on a railway line into the city, hoping blame the explosion on Chinese soldiers as an excuse for complete Japanese invasion and occupation. The attempt was laughable, with the first bomb failing to detonate and the replacement causing so little damage that a train to Mukden passed over the track without difficulty only ten minutes after the blast. Nevertheless, Japanese forces were quick to act, beginning an invasion on September 19th. Local Chinese forces, under control of the Chinese Republic (what became Taiwan) failed to repel the attack, choosing to focus their attention on battling the increasing strength of Chinese Communist forces. This inaction led to Japan’s total control of China’s Northeast and the establishment of the Manchurian puppet state. In the chaos of the invasion, services went offline across the city as power was cut and workers fled. The occupying Japanese army took complete control over the tram services, allowing Okura total control over a number of transportation groups throughout the entire Chinese Northeast. Even as far back as 1946, face masks were a popular fashion statement during Shenyang winters. The present day Zhongshan Square (Mao Statue) as it looked in 1946 after the expanded rail line. 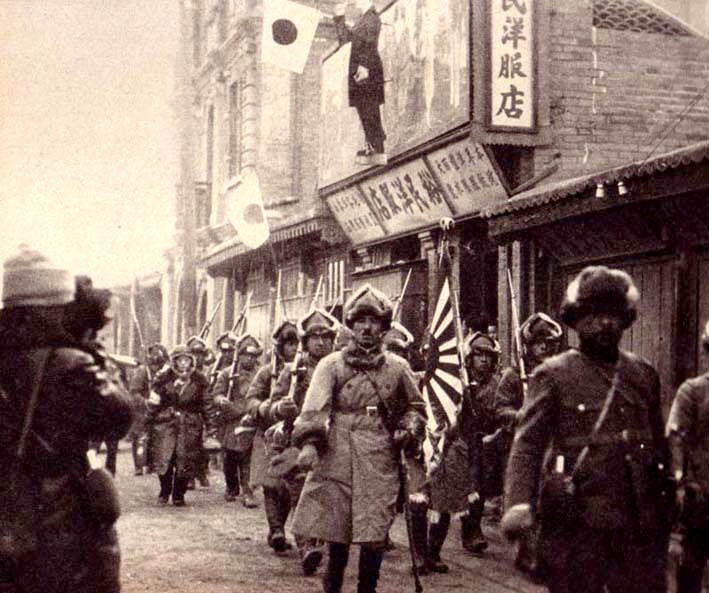 This scene was captured shortly after the Russians, who had only just done a very devastating attempt at "liberating" Shenyang from the Japanese, The area was cleared by the Guomindang (i.e. the political party that established Taiwan. This was also the first year the square would be called "Zhongshan" Square, replacing the occupied name of Naniwa Square. A slightly different angle and season. It was not until 1949, at the founding of the People’s Republic of China, that service was able to fully recover and life, for the most part, went back to normal. Passenger volume was still high, carrying over 81,000 people a day on average. 1945 saw the tram service expand to six lines bringing the network to 25.1km. Things would remain fairly steady up to the 1950s when the trams of Shenyang once again clashed with an ever expanding city. Workers at the Shenyang Tram factory celebrate the birth of the People's Republic by decorating some of the trams in celebration. This picture is from October 1st 1949. The third and final chapter of this series will carry on from the early 1950s, covering the golden age of Shenyang's trams to their untimely demise in the late 70s. It concludes with a look at the modern Hunnan tramway that opened in 2013.